Dr. Iqbal Al-Navdi is the Muslim Chaplain of the Canadian Army and an important Muslim leader here in North America. 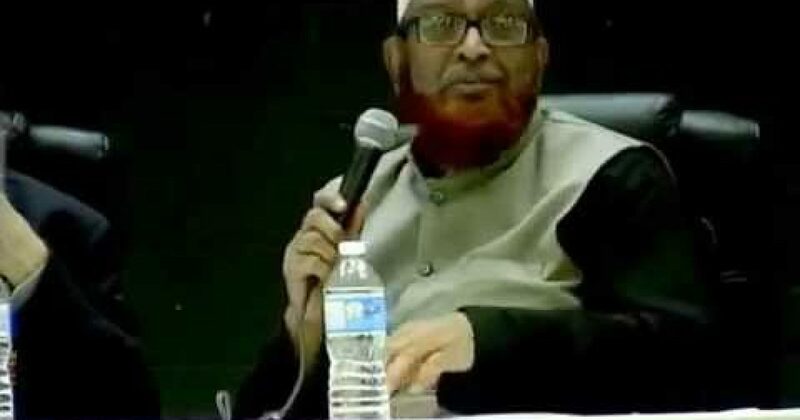 In fact, he is one of the very few in North America who have the authority to give a fatwah and is very well respected as professor of Shariah Law and jurisprudence. “In Islam as [inaudible] Qadar says many rulings (احكام) of the Islamic Law (الشريعة) in Islam, in Quran, [are] given just in concept, in brief, rights? But the family issue is covered by Quran in a very detailed way. Not only what we should do, but even what you do if face some problems. How [do] you solve it. “So in that sense for example we see that the protection of family is covered by Islam in three layers,right? “The first layer is – solve the problem mutually between husband and wife, right? In many times it happens that in these days and Glory be to Allah, meaning (يعني) when we are attacked, right? and Islam is criticized that Islam promotes suppose wife beating, right? and so many things. “Me, of example, I want to say one thing. First thing is that the is the ruling (حكم) of the Quran. It is existing. I can not change it. But I need to know from the messenger of Allah (رسول الله) peace and blessing be upon him (صلى الله عليه وسلم) what it means? How [do] we implement it? Do we have an example from messenger of Allah (رسول الله) peace and blessing be upon him (صلى الله عليه وسلم) that he ever used this order? Right? “So it means what? It means only that Islam is saying that the husband and wife issue and relation is so sacred, is so important, it must not be exposed to others. It supposes to be solved among each other. It is the first layer. “And this is the point where for example Quran says if you are taking the issue, and Hadith says, if you are doing this thing, you can beat or can leave [avoid sleeping with the wife]. But why? Just keep the issue among each other. “But the second layer is what? If it is not working make mediation, right? What? Bring one person from husband, one person from wife and they will do what? And Quran says what? إن يريدا إصلاحا يوفق الله بينهما If they are trying to make reconciliation (صلح) Allah will enble them to do this thing, right? This is one of the very mainstream leaders of Islam in North America, folks. He’s well-respected in the Muslim community and in the non-Muslim Canadian community. Here he is speaking at a “mainstream” Muslim gathering, and he is teaching hundreds of Muslim men (plus the thousands who have watched on video) that it is perfectly acceptable to physically abuse their wives. The religion of peace, where beating your wife is totally cool.